Who likes buffalo chicken? I certainly do! While it often feels like it’s setting my mouth on fire I love the spicy flavor of buffalo chicken especially when paired with cool Ranch dressing. It’s that hot and cool flavor that gets me every time. So I often cook buffalo chicken items. I’ve made buffalo chicken sandwiches, buffalo chicken pizza, buffalo chicken tacos, and a few other dinners as well. 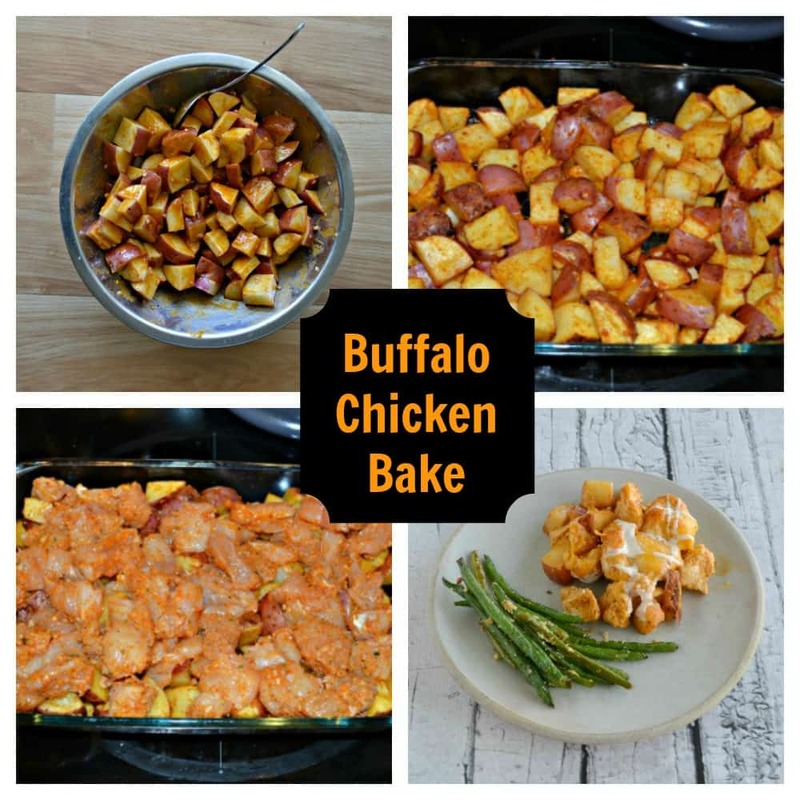 My husband likes it as much as I do so whenever I see a recipe for buffalo chicken that sounds unique I make sure to try it out. 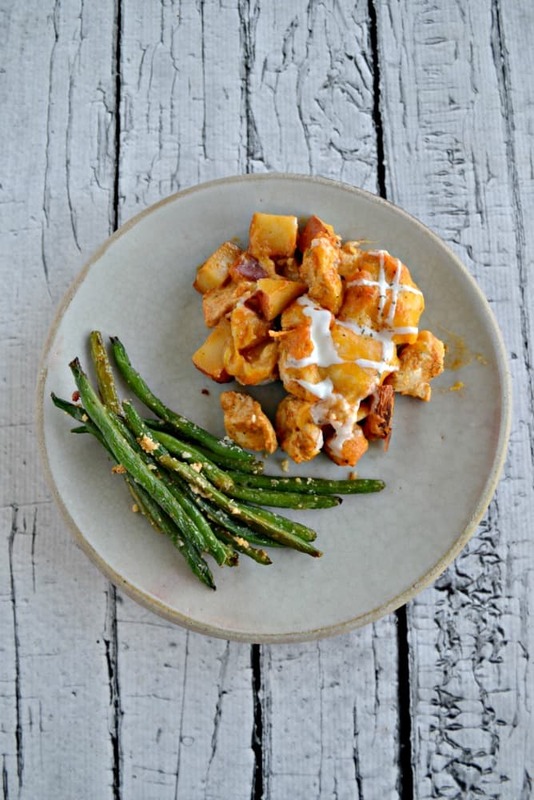 This Loaded Buffalo Chicken and Potato Bake is one of those recipes. One thing that drew me to it is while it takes almost an hour to bake the hands on time is around 10 or 15 minutes. That is perfect for me. I like to prepare dinner, get it in the oven, and then either relax or finish up some blogging before dinner is ready. 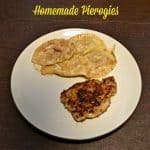 This recipe did all of that for me. I also like that you simply make the sauce one time and then use it twice. This also made clean up pretty easy for me. 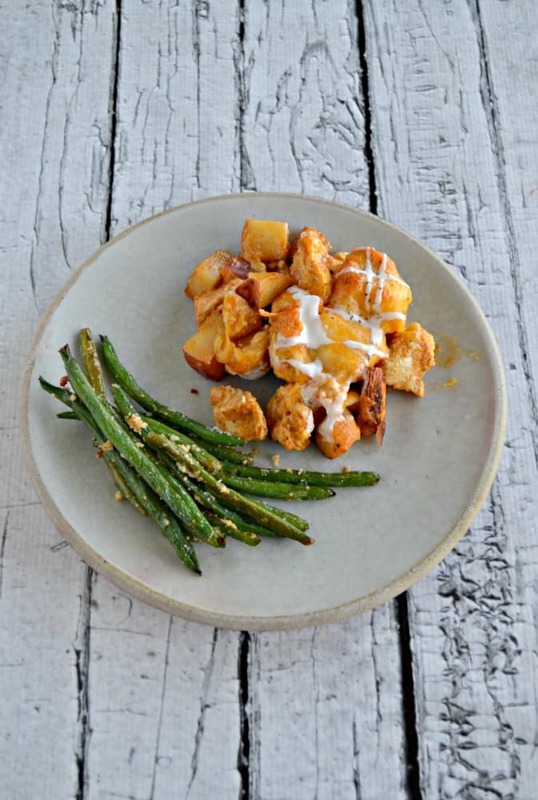 The recipe starts by tossing chopped potatoes in a spicy buffalo sauce and baking it in the oven. While it’s baking you toss the chicken in the sauce and then after the potatoes are getting soft you put the chicken on top of them, top them with cheese, and bake it until everything is cooked through. 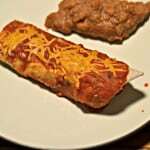 This is a really tasty and easy to make dinner recipe. We liked how the potatoes were cooked through but not too soft. The chicken and potatoes worked well together and I drizzled ranch dressing over top of the entire thing to help cool off the spicy buffalo flavor. 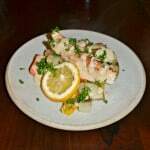 I served it with roasted green beans to add a little color and flavor. 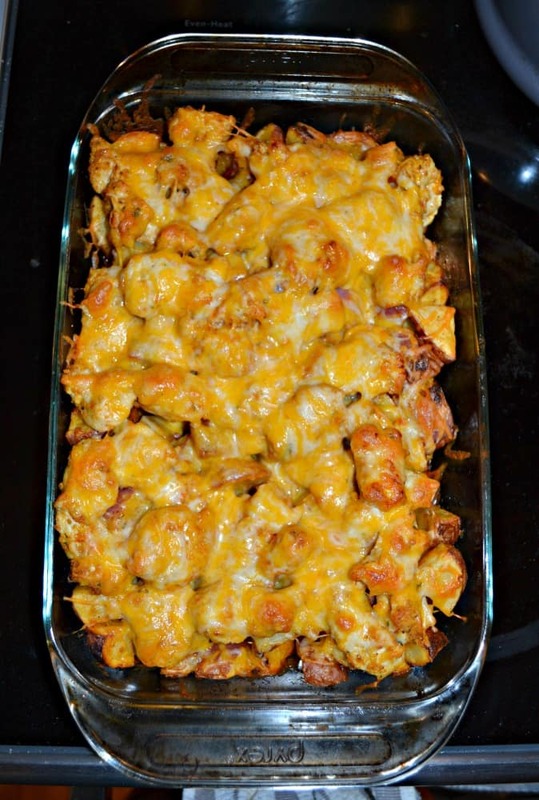 Enjoy an easy to make and delicious baked casserole of buffalo chicken, potatoes, and cheese. Preheat the oven to 475 degrees. Spray a 7 x 11 pan (or something similar) with cooking spray. In a large bowl combine the olive oil, salt, pepper, paprika, garlic cloves, and buffalo sauce. Add the potatoes and toss to coat. Using a slotted spoon, spoon the potatoes into the prepared baking dish. You want as much sauce as possible to stay in the bowl. Bake for 45 minutes, stirring every 15 minutes, or until the potatoes are softening. Meanwhile, add the chicken and breadcrumbs to the bowl with the sauce and toss to coat. Once the potatoes have cooked for 45 minutes pour the marinated chicken over top of the potatoes. Sprinkle with the cheddar cheese. Bake the dish for 15 minutes or until the cheese is bubbly and the chicken is cooked through. Drizzle with Ranch Dressing and serve. This looks delicious! I love anything with buffalo chicken. Will have to try it out, thanks!